The long-fears impending destruction of Palmyra, not “just another town on the map,” says the NBC Nightly News, but a site for “erasing history” has been identified as an epicenter of the feared project of cultural genocide of opulent archeological remains–as well as of actual human deaths. 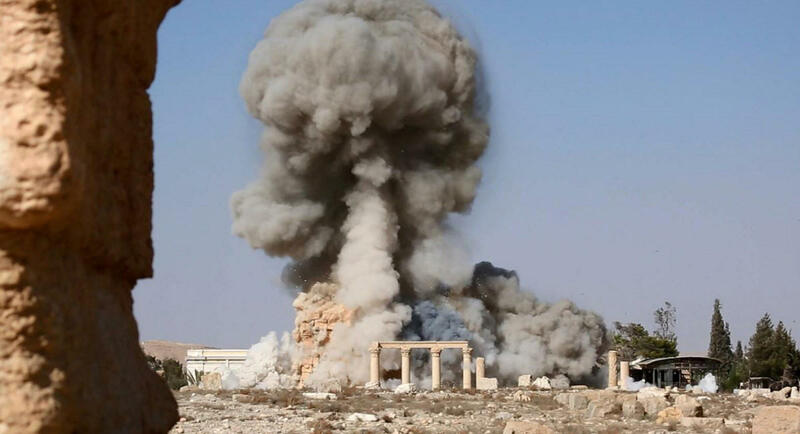 After the Islamic State published photographs of the destruction of the World Heritage Site, the recent damage assessment of the city recovered by Syrian forces suggests the preservation of some 80% of ruins, and despite the reduction of several 2,000 year old temples to rubble, after Syrian Army jets helped retake the ancient city. Yet the episode suggested the horror of the loss of ancient fragments that ISIS seems to have decided, with good judgement, to preserve, including its Roman amphitheater, despite the apparent destruction of its elegant Triumphal Arch. Many objects were, of course, sold on the black market to raise needed funds. The longstanding difficulties of securing artifacts from smugglers from ceramics to bronze lamps to mosaics illustrating Homer’s Odyssey to medieval illuminations of the Quran, to the destruction of actual minarets, souks, and entire sites of archeological excavation. David Brook’s claim that ISIS has created a wormhole of history that has transported us to a “different moral epoch” as much as a different political landscape, utterly removed from the moral codes he has recently celebrated, affords a prime spot to the destruction of archeological treasures. 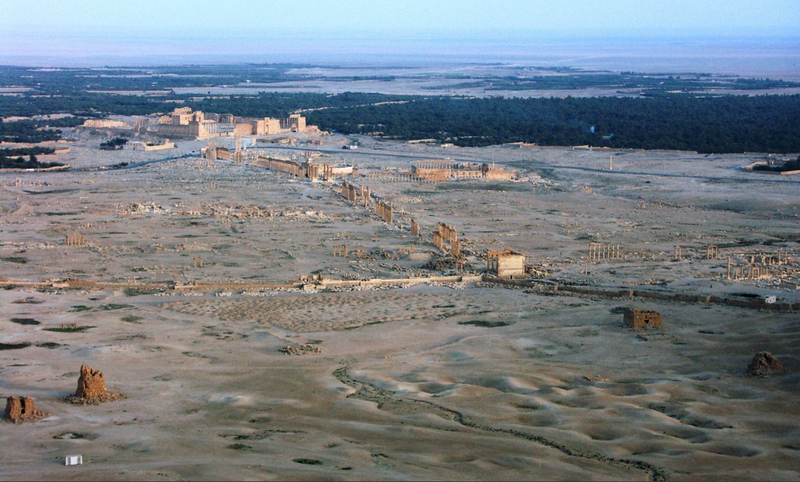 As much as introduce a “wormhole”–a space-time passageway, theorized by Einstein and Rosen as a theoretical “bridge” that jumped huge distances that connect distances of billions of light years, the topography of Palmyra’s ruins offer something of a historical echo chamber as the fears of the disturbance of its awesome ruins were relayed across the world wide web, as well as an act of unpardonable criminal destruction. 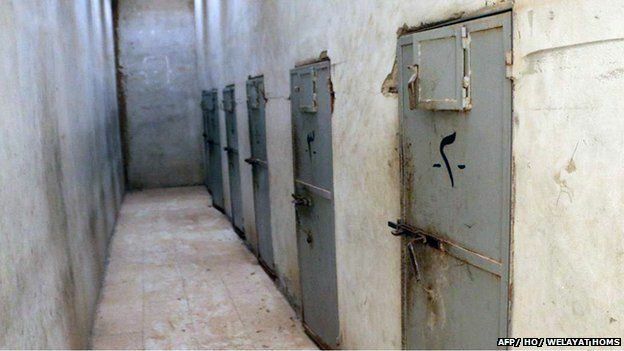 Although the capture of the city may have been more closely tied in the mental geography of ISIL figures to Tadmur prison‘s destruction, a site of arbitrary and inhumane detention from the 1970s–“High walls of cold cement/ Control towers/ Mine fields/ Check points/ Barricades and special military forces/Finally… A space of pure patriotic fear,” wrote the poet Faraj Bayrakdar, who had been imprisoned there for some six years, “If the whole of Syria falls/ This prison will never ever fall.” But the French-buiilt prison, fashioned as a panopticon in true Benthamite style, was the in the 1930s in the desert, site of a massive slaughter of members of the Muslim Brotherhood by Hafaz al-Assad’s henchmen and of sanctioned beatings and whippings, whose interiors were first broadcast by the ISIL as they recaptured the site and before they had destroyed it, were almost emblematic of the crimes against humanity of the current regime’s predecessor. The attention to this site of fear and horror were quickly shifted, however, to the fears of the destruction of the city’s ancient amphitheater, which quickly became an arena of institutionalized violence for ISIL occupiers. Such growing fears of expectations of destroying a Unesco World Heritage Site that would surely lead to a swift world-wide condemnation–as well as an offense against Syrian culture–were stoked by worldwide media, and must have partly led ISIS to release multimedia images that affirmed the preservation of cultural heritage that lies on the site of the Syrian-Iraq border to calm such accusations. Even as the Director of Antiquities in Damascus has asserted that many treasures have been preemptively removed from the city, a counter-offensive by ISIS was adroitly waged on the world-wide web, as they posted images of intact ruins in the Syrian city–even as the humanitarian crisis in the area grew with air-strikes from the forces of Syrian strongman Bashar al-Assad. 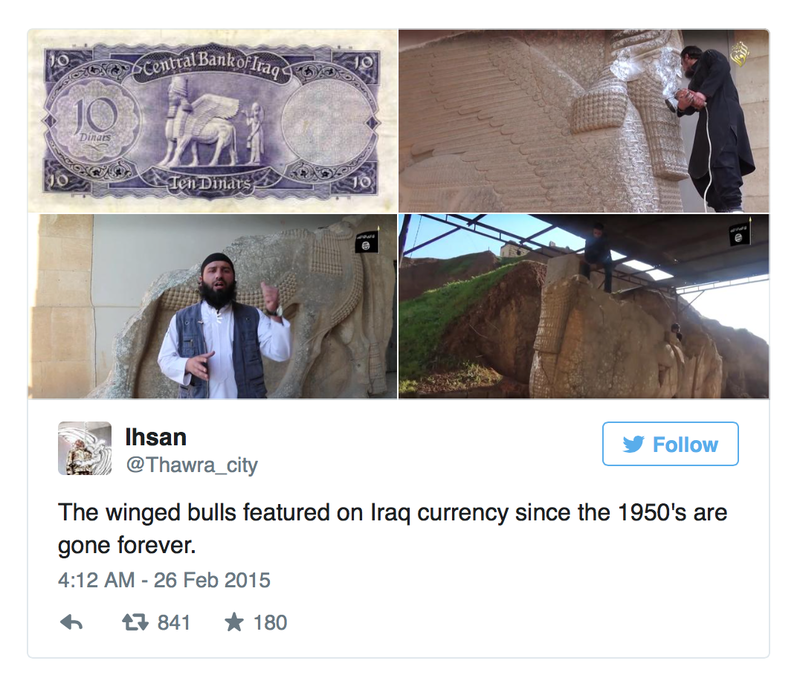 Whether the Palmyran monuments would be considered part of Syria’s cultural patrimony or antique architecture is not clear, although the manner that the winged Assyrian bulls or horses constituted part of an Iraqi cultural patrimony–much as the ruins of Palmyra for Syrian–may be very tragically overlooked. In asking what constitutes a historical monument and what a religious icon, al-Saoudi raises a cultural quagmire and a debate on iconoclasm all too familiar from the sixteenth-century Reformation if itself also inherited from the ancient world–even as he seeks to invest the destruction of a classical heritage with an aura of doctrinal debate. But the possible preservation of many statues, if indeed taken to safekeeping before the invasion, has not led to any hesitation of using the backdrop of its second-century ancient Roman amphitheater to round up and execute at least twenty supporters of the Syrian state, according to the Syrian Observatory of Human Rights, and kill two hundred more. What constitute the Palmyrene divinities–reliefs on funerary monuments? lions and eagles with open widespread wings? images on tombs?–is open to interpretation and will probably not be that closely overseen. The monuments that have remained less vulnerable to air bombardment, weather damage, acid rains, suggest a vulnerability to the widespread but only recently recognized looting of antiquities that have slowly resurfaced on the black market, providing a source of income that has recently rivaled Syrian oil fields as a needed source of cash as other sources are drying up for ISIS–if we trust the record of financial transactions recently found on one of the flash drives of an ISIS commander, which detailed the sales of some $36 million of stolen ancient artifacts that were sold on the black market. 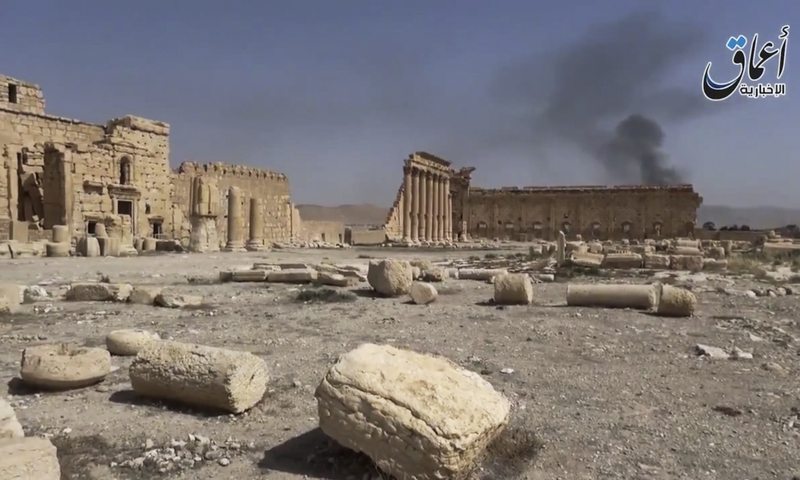 The recent specter of the destruction of tombs outside the city of Palmyra by explosives offered a taste, however, of the destruction that might be waiting to be unleashed. Is it really true that, as the New York Times reports, the cultural vandalism of tombs and statutes–a destruction whose propagandistic value Amr Al-Azm of Shawnee State University compares to the choreographed beheadings of captives as designed to appeal to some ISIL supporters–occurred as a cautionary warning to nearby Syrian troops? or a sign of their withdrawal from a region, and the acceleration of demolition in the face of military defeats? The value of the Palmyran antiquities to ISIL, whose sales of antiquities from an Abyssinian monastery in Syria’s Nabek district totalled $36 million, must reveal canny knowledge of the calculus of their value as intact objects. 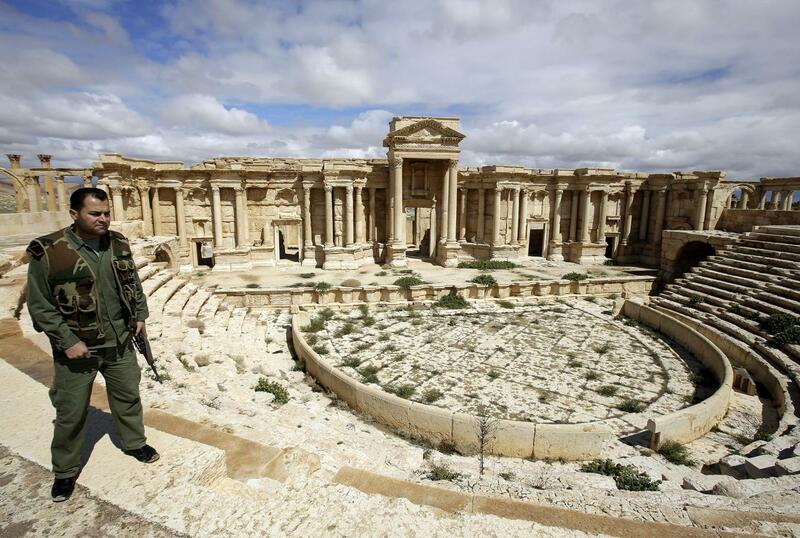 So many antiquities now stand guarded by Syria’s government that a list of Emergency Red List of Syrian Cultural Objects at Risk has been distributed to border guards, as many looters in ISIS have become amateur archeologists, and, until ISIS troops took the city, a guard was stationed at the amphitheater itself, as if to declare its worth to the state. The release of some ten photos by the Islamic State showing the preservation of architectural ruins contrast to the familiar photos posted online in February of the destruction of antiquities in Mosul, but seems to be an attempt to repristine their image, despite the brutality of the executions, as Syria’s official news agency, SANA, released file photos of the city’s antiquities that were threatened with destruction, no doubt in an attempt to gain world attention as well as stoke nationalist sentiment as well as horror. The place of antiquities is a delicate one within the propaganda forces that have mobilized behind the war, with ISIS using the destruction of antiquities as a bit of a rallying cry to supplement Jihad, long after it had actually destroyed substantial numbers of churches. 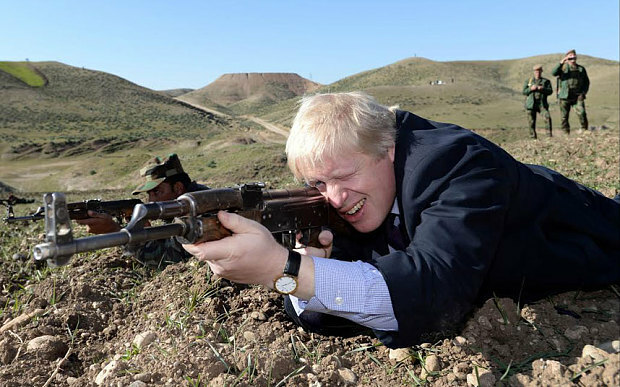 But if the value perceived in the destruction of antiquities may have been feared to make Palmyra something of a poster-child, the videos that successfully cast the ISIS trips as philistines for folks like Boris Johnson, the former mayor of London who confessed to be moved to future mobilization by the hopes to defend Assyrian Gods who sport “those curious ringleted beards in the shape of typewriters” and profiled horses, as if they were ready to suddenly sign up for fighting on the frront lines to defend the heritage, or at least give thanks for the oft-criticized custodial role London’s British Museum–which seems to have been Johnson’s real (and openly knee-jerk nationalist) point. Although Barack Obama and the United States has not openly entered the conflict, the ongoing promises of continued military, economic, and diplomatic assistance has been poised behind the notion of joint Sunni-Shi’ite counteroffensives yet to materialize, but seemed to place us on the brink of war. But Palmyra stands at more than the symbolic epicenter of the war, or as a strategic gain of the extent of “territory” that ISIS (or ISIL) can be said to “hold” as a cohort of alliances: it is a benchwater of how rapidly the Islamic State has spread, and the rapidity with which the Syrian Free Army, without any credible external assistance, has been able to hold agains the two-fronted assault it faces from government and foreign troops, and its effective marginalization to the West. The expansion of the congeries of ISIS/ISIL-held lands have effectively isolated a front in the northeast from the western fronts against which limited resistance remains, and Assad’s forces have proved to be little effective military resistance. 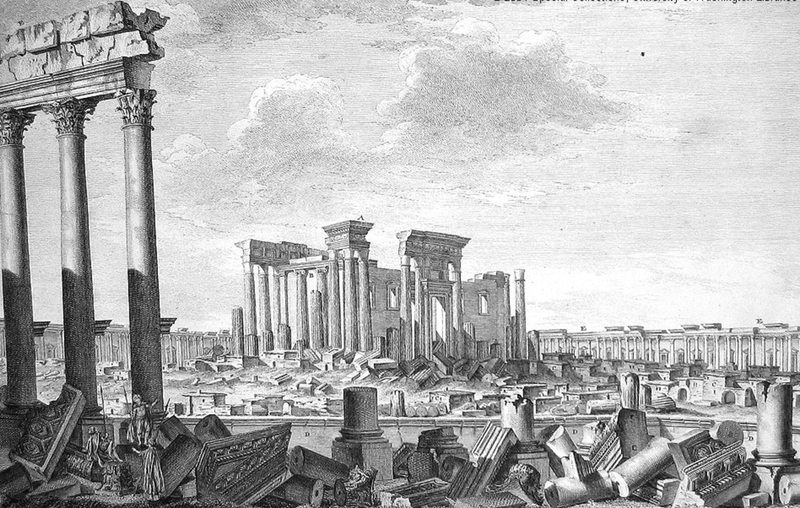 In a sense, the ruins of Palmyra are enshrined as sources of material contact with the past in the landscape in the engravings from Robert Wood’s Ruins of Palmyra, otherwise Tadmor, in the Desart [sic] (London, 1753), based on the surveys taken by the architect and artist Giovanni Battista Borra, informed by Borra’s own close study of Vignola, which are again echoed in the visual composition of many of the images of the local ruins now feared to be facing destruction or destroyed in the global media. Borra’s expertise in such neoclassical views had been honed, interestingly, in his own set of views of Turin, Vedute principali di Torino disegnate in prospettiva, as well as his views of Rome and Tivoli, which his dramatic elevated views of awesome intact colonnade and surrounding ruins echoed. 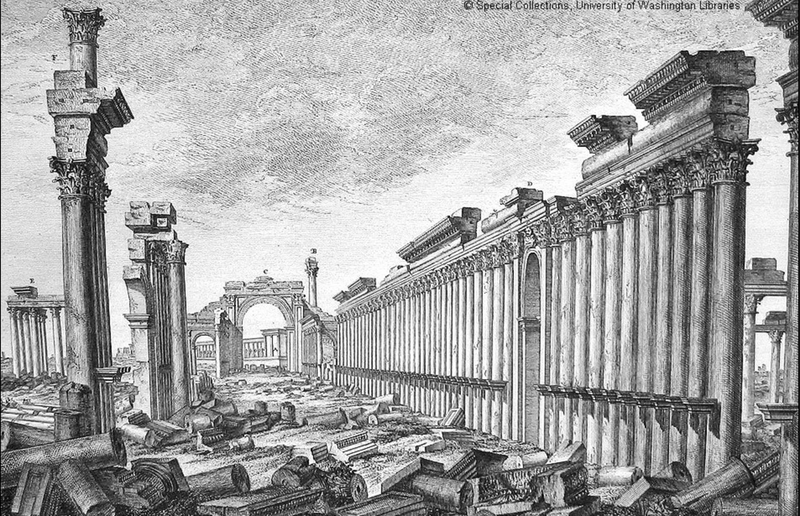 But Borra’s Palmyran views of Wood’s archeological sites gained an international appeal that provided immediately accessible memories of the elegance of the city’s ancient past and a repertory for neoclassicism. And rather than a prison, their grandeur suggest the odd emptiness of Ozymandian ruins of past grandeur that his own architectural expertise allowed him to recognize. Borra’s majestic engravings are romantic, if oddly analytic in their silent statuesque melancholy. They also evoke the tragic prospect of the loss of such sites, whether due to ISIS militia or possible future aerial bombardment of the region from Assad’s Syrian air force if not American troops. While standing at quite considerable chronological remove, their silent beauty serves to underscore an enormous potential tragedy of looting a desert landscape of ancient architecture. All too often, however, we are apt to focus on the awe of monuments that have so long occupied the Western imagination–with a legacy this post has rather cursorily tried to map–rather than the humanitarian injustices of the continued displacement of human refugees in the ongoing Civil War, according to images released by Human Rights Watch this April, for which there seems no clear end in sight–especially along the so-called “demilitarized” border between Syria and Jordan. 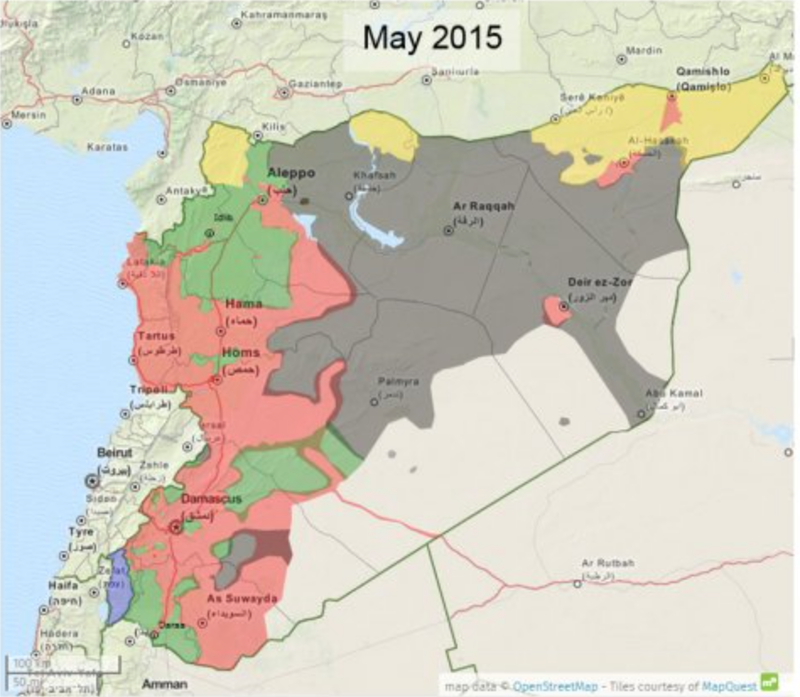 Syria, for now, remains on the map. But in the course of over two years civil war aged across Syria, the government of Bashar al-Assad has stock-piled chemical weapons as a last line of security in multiple sites. President Barack Obama’s administration has made use of chemical weapons against Syria’s population a justification for military attacks against or intervention in the country. But the prominence given to drawing this “red line” on the use of such weapons neglects to assess the pragmatic results of any intervention, and the nature of what form on-the-ground intervention in the relatively shifting state would take–or what ends such military actions would be able to serve. The on-the ground situation is more complex than this map of reported violence: especially if one looks at the disparate groups that have independently continued (or sustained) the ongoing rebellion against the Syrian government, or, even more strikingly, at the huge number of internally displaced Syrians, a number greater than anywhere else in the world; and the number of Internally Displaced People is difficult to count; estimates are 4.25 million–almost 1 in 5 Syrians. The consequences of this displacement are impossible to map. 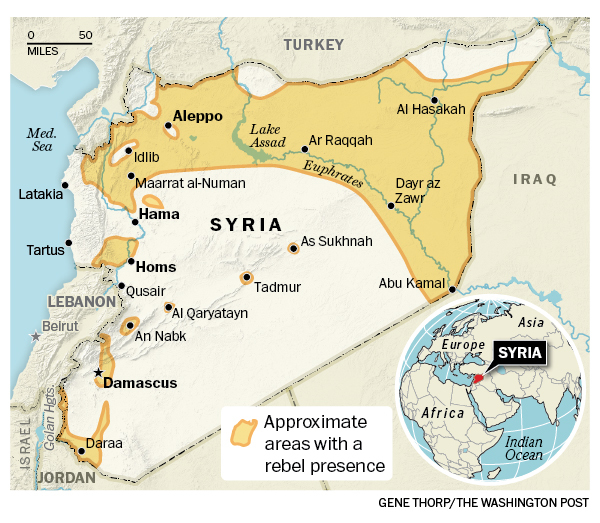 Despite using a uniform color to denote “rebel presence” as a single, uniform beige to mask divisions within “rebel presence” and the numerous individual deals that the Assad regime might make within them–and mask the actual of what David Brooks and others correctly identify as a “proxy war” between Russian planes flying from Iran over the nation, Hezbollah present in Syria, and with multiple “combustion point for further waves of violence.” The war is, in fact, not properly “civil” at all, so much as a broader war for the realignment of Middle East politics–and despite the attempts of previous administrations to involve rebel groups within the negotiation, the readiness with which the Trump administration seems more ready to strike–or threaten to strike?–from the eastern Mediterranean, Persian Gulf, and Red Sea–with less attention to the ethnic composition of Syria, than its own show of strength. 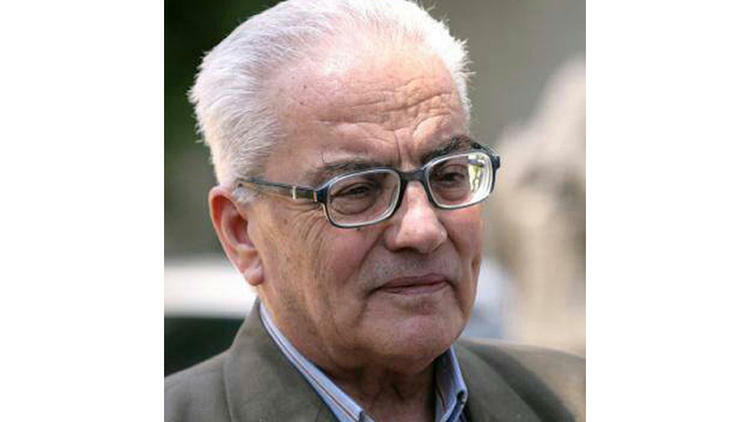 Yet the divided nature of the country lies in part in the improvised nature of resistance to a totalitarian regime, and the culture of violence that has been normalized within the Assad regime and within Assad’s security forces–the notorious Air Force Intelligence (إدارة المخابرات الجوية‎), whose ties to chemical weaponry have been substantiated in the recent past. The map poses deep questions of what intervention would mean without a clear map even available to be read. 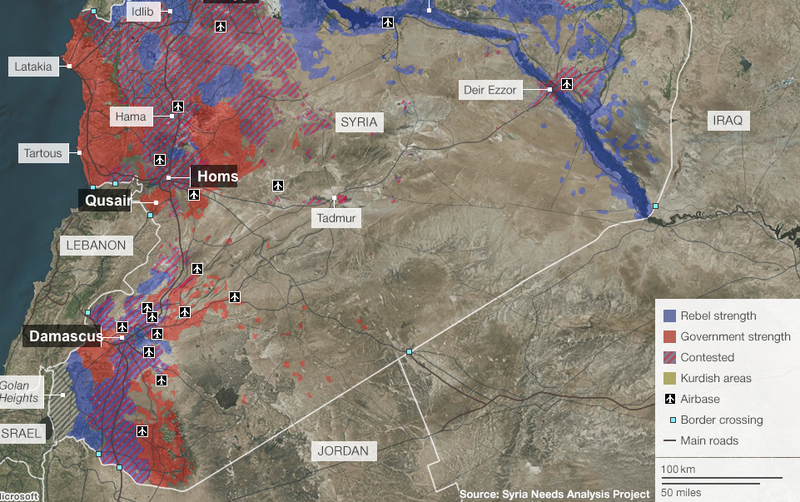 They also reveal how much the debate about war is being waged not only in words, but maps. The focus of global attention is not only on the violence that has divided the country for over two years, to be sure, or the humanitarian disasters created by the many refugee camps on Syria’s borders, but allegations of the use of chemical weapons. 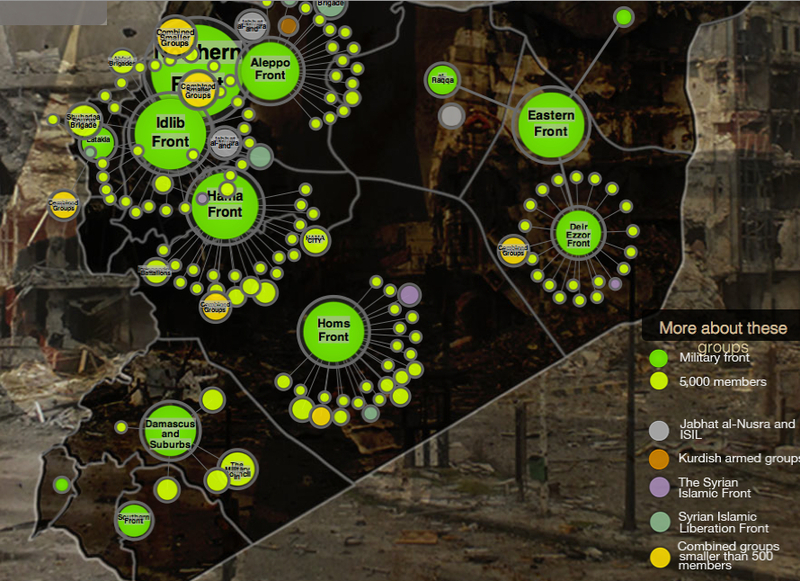 Yet the mapping of Syria’s disasters and composition are central to any discussion of military intervention. What sort of a vision of Syria as a country does it describe? The visually striking deployment of skulls-and-crossbones icons to designate locations of plants that produce chemical weapons is scary, and so much so that it almost evokes incursions by pirates along the Mediterranean coast–as much as sites of chemical weapons. (Of course, such sites would not in themselves be targeted, but the decision to avoid them depends on the accuracy of military intelligence; the decision to target all pharmaceutical factories also poses a future crisis for already over-crowded Syrian hospitals.) But it suggests a rather blunt map of the notion of military intervention, and reveals the difficulty of projecting a limited surgical strike against selective sites that are removed from the Syrian population. In the light of the relative military success of the long-distance bombing strikes into Algeria, it seems tempting and morally compelling option to end the violence and self-evident terror of gas attacks by unseating the Assad tyranny, or by providing Syria with a clear warning–although what it would warn we are not sure–against purposefully deploying chemical agents against its citizens. 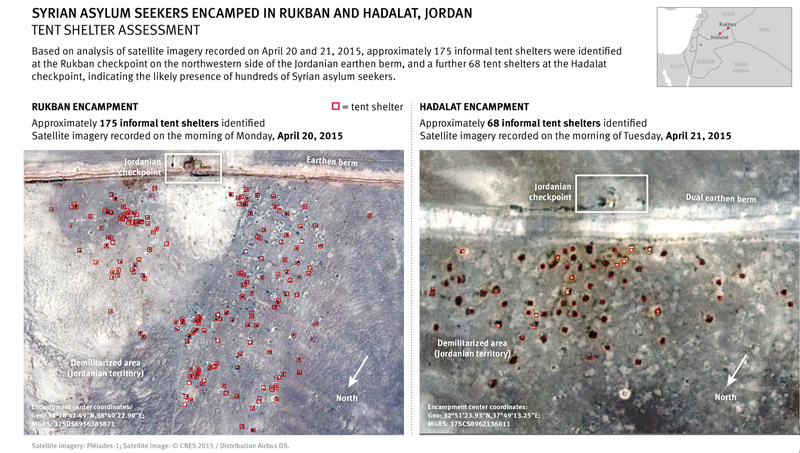 The map raises many questions by marking so many facilities along Syria’s Mediterranean coast. It makes one wonder how such a map became so easy to reconstruct–and the wisdom of allowing such a plan of attack to be rendered public on the internet. For the map suggests that strikes can be easily launched, in a sort of war conducted from aircraft carriers at a distance against Iran’s close ally, firing Tomahawk cruise missiles at them from American warships moved to the eastern Mediterranean–although it’s relatively easy construction has led many to openly wonder why such a detailed range of options would be publicly leaked by the White House in such detail, even indicating the targets of a strike of one to two days against fifty specific sites. (Reuters found redeployment of many key army, air force, and security headquarters buildings in central Damascus that might attract U.S. cruise missiles, and poison storehouses, if not sites of production, could be moved.) Would it be worth the potential danger of hitting a storehouse of sarin or FX? Targeting chemical factories, moreover, does not address the likely existence of available chemical arms–although attacks render their release more likely. Every chemical plant is not the producer of sarin and mustard gas. 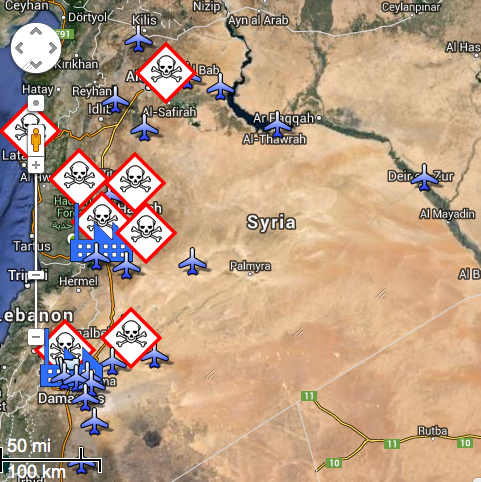 In imagining the raids on the air-bases and potential sites of chemical weapons, the map takes advantage of a registry compiled by the Nuclear Threat Initiative locating where weapons are either manufactured or stored. Yet despite the offensiveness of chemical gasses, their repellent nature, and their close historical association with threats or attacks of terrorism, what sort of counter-attack on the Syrian population the government would unleash as a response to the attack is not clear. The attempt to paralyze Syrian aircraft who might attempt to deliver them seems worthy, but the bombing of potential plants risky at best. Bombing sites of chemical production doesn’t sound like that great an idea after all, however, since this would most likely disperse the very gasses that they contain–with more dangerous effects than the uses of Sarin or FX against the Syrian population–if such targeting would of course not be intentional. How any such sort of attack will change “action on the ground”–and the questions of what military strike can alter the humanitarian and moral disaster that Syria has already become–remind us of the pressing need to have a clearer map of the action on the ground than a Google Map can reveal, as we examine consequences of a “limited air strike” beyond the hope to cripple the Syrian airforce or discourage the terrifying possibility of further use of poisonous gas against an opposition–and ask if a “limited air strike” is possible in this complex geopolitical microclimate. 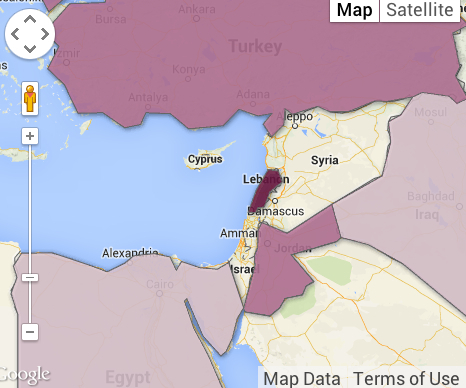 Color-coded according to the largest number of Syrian refugees received in each country, we range from deep purple in Lebanon (more than half a million refugees dwell), and just less than half a million are in Jordan and Turkey, and smaller numbers in Iraq and Egypt – 161,879 and 75,456. 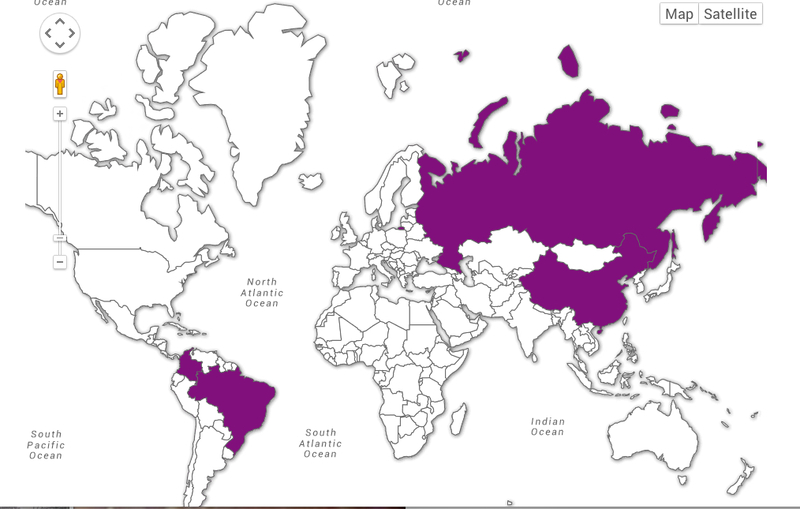 This alternative geopolitical map serves as a negative view of the strategic relations between he nations. It also poses a problem of how each of these countries respond to the crisis: such a data-visualization fails to render the different immediate challenges of each refugee family, their poverty, and their amassing on the borders of each region, rather than throughout the country. 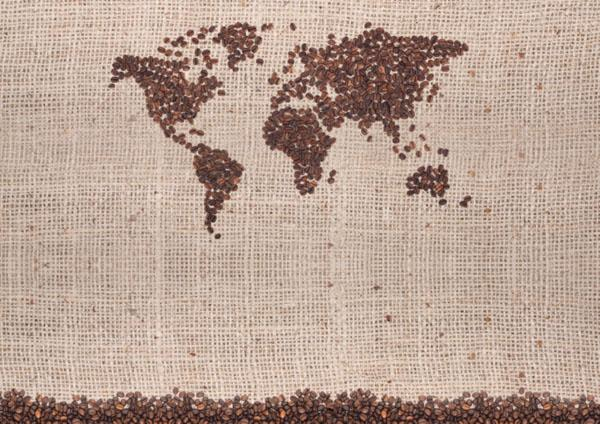 For this is a humanitarian disaster waiting to be mapped. 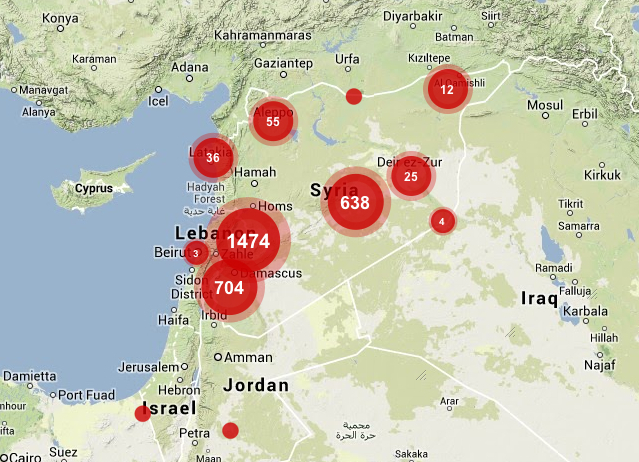 Given the difficulty in mapping the multiple divisions within the country into rebel and government forces, and the crises of internal and external displacement of Syria’s population, we must resist seeing mapping clear targets of attack. The maps of clear divisions in the country as a clear opposition of forces are distorting filters that are more distracting than they are informative, with overly neat and tidy boundary lines. The complex conflicting rebel factions supported by backers, and the sort of power vacuum that would be created by significant and serious destablization of the country or desperate responses (or the shifting of responsibility) that strikes against the country’s remaining inhabitants might trigger. 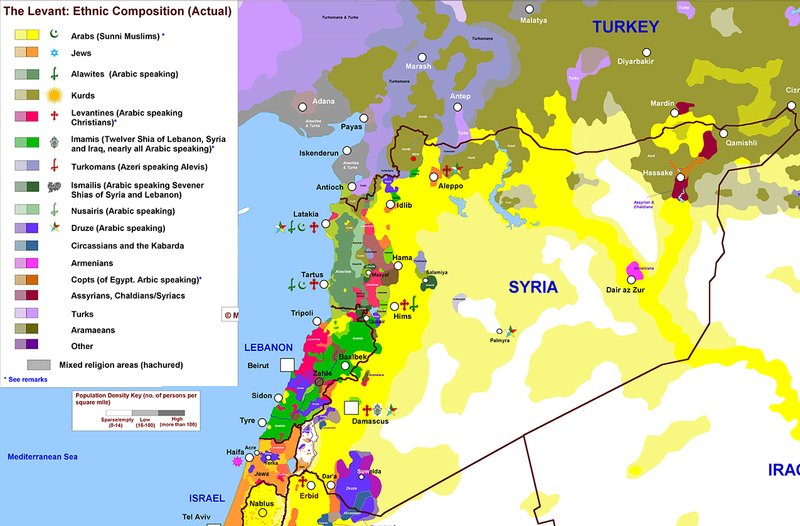 Syria’s conflict of course exists not only as a map of frontiers and inhabitants. Worldwide, it should be remembered, there remains significant opposition to military intervention, charted by Mona Chalabi and Charlotte Henry in the The Guardian’s datablog–not only because of longstanding alliances between Iran and Syria, or Syria and Russia, but exceedingly complex questions of what ends intervention would accomplish–and what outcomes it would produce, as well as how it would be sustained. Viewing the conflict in Syria not only through the lenses of national alliances, but by what can be best mapped on the ground, must become more central to US foreign policy objectives. We cannot “chastise” or “wound” the Assad regime without realizing that we may wound the country, or erase it from the map. –suggests a removed image of the ability to launch air strikes against a nation at a remove from the ground, and an ability to “target” strikes–the illusion of GPS–at a single dot, without registering the huge impact such strikes would have on a country and is inhabitants. In an era of shooting first and asking questions later, by 2017 we use maps to fire from the hundred and five missiles on Assad’s “chemical weapons facilities” as “surgical strikes” by tools able to pinpoint chemical weapons storage and research facilities outside Syrian cities, as if they have a fixed non-human target to eliminate. Can the promise of mapping with such precision inflate a sense of the ability to intervene from a remove, targeting targets outside Damascus as the Barzah Research and Development Center, or the Him Shinshar complex outside Homs, without terrorizing the Presidential Palace, and without worrying that such armed interventions will not eventually escalate, as they dramatically change the experience on the ground?